Famous across the world for its crimson sunsets, the caldera, the breath-taking views, the important history, the volcanic beaches and the delicious tastes; the island of Santorini awaits to unfold its beauty. Located in the centre of the Aegean Sea and the island complex of the Cyclades, Santorini today is one of the top holiday destinations in the world. Do not miss out on visiting the prehistoric settlement of Akrotiri, the Ancient Thera, the Museums and of course enjoying the magnificent views to the caldera from Fira, Firostefani, Imerovigli and Oia. Swim at the beaches of Kamari, Perivolos and Perissa; close to Oia you will find some gorgeous natural beaches. 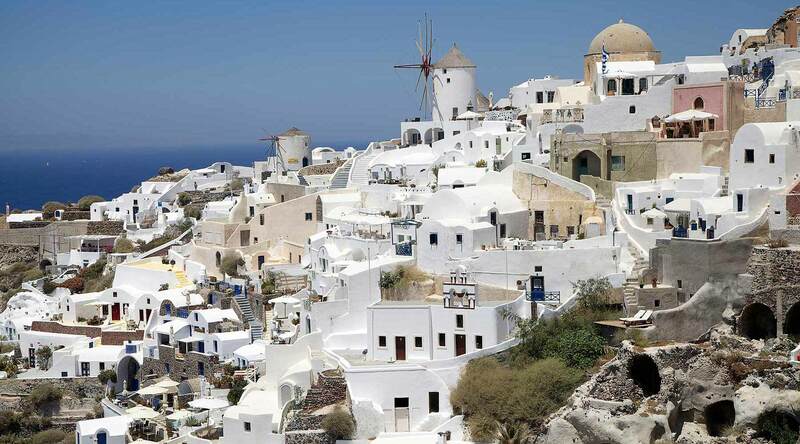 Taste the volcanic flavours and toast to Santorini’s sunset with a glass of Vinsanto wine. There is a whole world of beauty and uniqueness to discover in Santorini. The K & K Unique Holiday Homes propose two different accommodation choices on the island; Villa Afoura, a traditional wine factory transformed into a villas complex and Villa Anassa, a renovated mansion, in the village of Oia.